My mother's paternal grandparents were German. Johann came to the U.S. in 1877. He was 18 years old, and came to join his older sisters who were living in Philadelphia. He lived in Chicago for a while and then in 1884 moved to Rock County, Minnesota, where he took up farming. He became a U.S. citizen in 1891. Martha was born in 1863 in a small town in New York. Her parents were German immigrants who had arrived in the U.S. as children. They moved to Rock County, where Martha and Johann were married in 1887. Johann and Martha's first two children died of diphtheria, and the third of whooping cough. With three more children, the family moved to California, where my grandfather John was born. They lived in a rural area where most of their neighbors were German, and their home language was German. When the older kids started school, they discovered that English was the dominant language. As they learned, they also taught their younger siblings, so by the time my grandfather got to kindergarten, he was prepared. The children were bilingual, speaking German at home with their parents, and English everywhere else. After their parents died they stopped speaking German altogether. During World War II, when Japanese-Americans were hauled off to internment camps, the local German community was horrified. They feared that they would be next. The older people were especially frightened because many of them did not have their paperwork in order. In fact, a relatively small number of Germans (mostly non-citizens) were imprisoned, but as it turned out, there was no real threat to the members of my great-grandparents' community. Germans were safe largely because there were so many millions of them (either immigrants or the children and grandchildren of immigrants) living throughout the U.S. They also had the advantage of not being targets of blatant racism as the Japanese were. All this happened long before I was born. Growing up, I knew little about the German branch of my mother's family until we traveled to Europe and she looked up some distant cousins. My grandfather and his surviving siblings hadn't spoken German in decades and were no longer fluent. They did not define themselves as German, or even as German-American. Like so many ethnic groups before and since, they were simply, and proudly, Americans. This undated photo was taken some time between 1879 and 1911, probably before 1900. My great-grandmother Martha is fifth from the left in the back row. 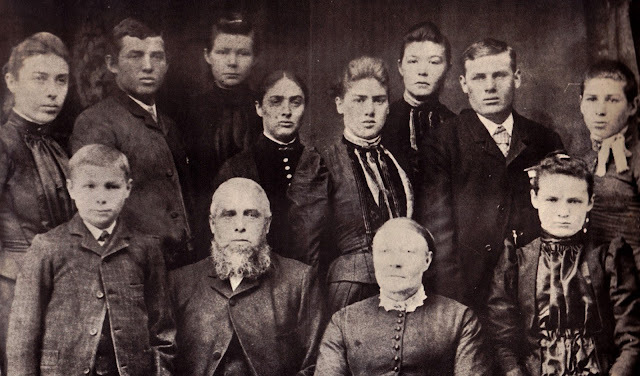 Her father, my great-great grandfather Jacob Frederick, is the bearded man in the front row.